“Eureka!! We found it!” The blend that is – the blend of four voices and four friends. Sloane had sung tenor in her previous quartet and was very keen to ‘take the lead’. Enter Annette (bass) & Anke (tenor), and together with Annette (bari) – it was definitely a ‘eureka’ moment when, in October 2013, ‘Eureka’ quartet was ‘found’. 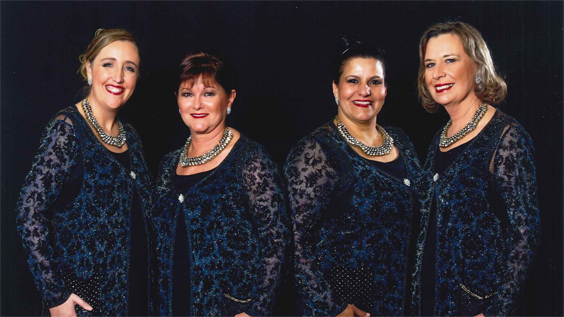 Eureka’s debut performance was at ACW’s show in Kalamunda in March 2014 and the quartet’s first contest was in May 2014 at the Barbershop Harmony Society Western Region contest where the ladies placed 3rd. 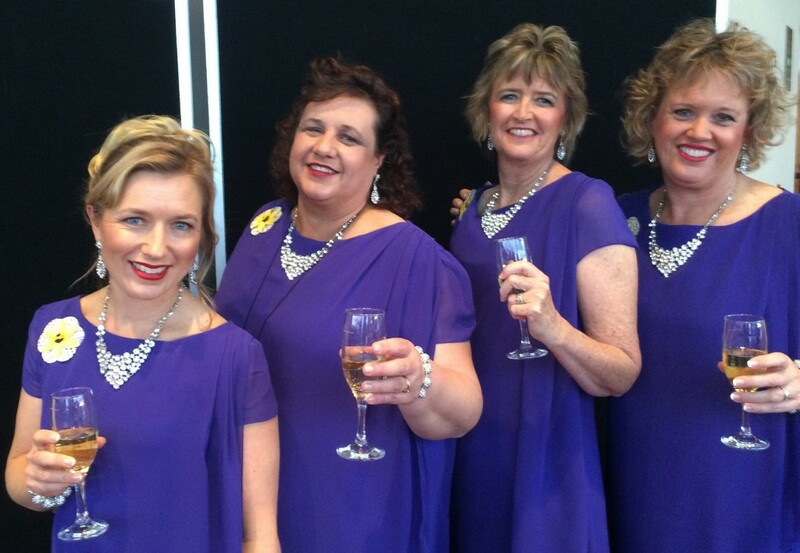 On May 15th 2015, Eureka was absolutely thrilled to place 3rd in the Sweet Adelines Regional Convention in Hobart. 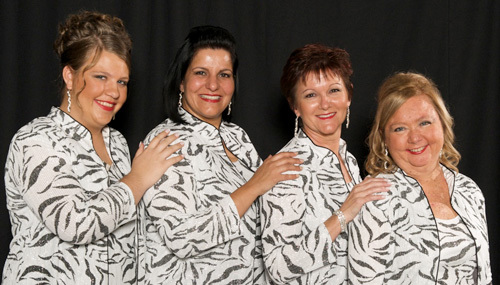 It was a dream come true for all four ladies – and extra special for Anke, this being her first ever Sweet Adelines contest! Eureka is available for performances – please see https://www.facebook.com/EurekaQuartet for further details. Consists of Cathy Woodhouse (tenor), Robyn Main (lead), Dale Tiernan (bass) and Linda Wilson (baritone). 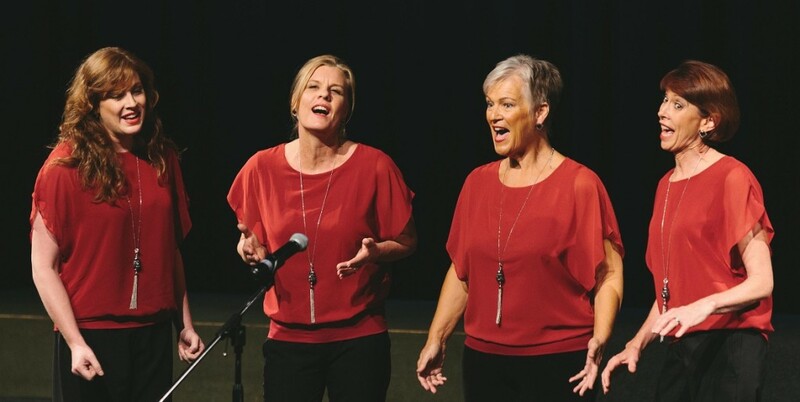 Robyn, Dale and Linda are all members of A Cappella West Chorus and have been singing together for two years as at November 2017. Cathy is a Chapter At Large Sweet Adeline and joined the quartet in May 2017. You can follow our journey on our facebook page. Please message us there to book us to perform. We look forward to singing for you. Hi-Jinx were formed in January 2012, and only four months later, they competed at the SAI Australian Regional contest in Canberra, taking away the gold with a record score in Australia. They have backed that up with wins in Perth, Sydney and Hobart, breaking their original record twice! They have competed at International level in 2012 in Denver, in 2013 in Hawaii, and in 2014 in Baltimore. They were thrilled to place 19th out of 52 quartets in Hawaii (a first for any Australian quartet) and backed that up in Baltimore with 19th again. They are hoping to improve on this in Las Vegas in 2015! Lindsey, Bec, Kirsten & Jo are thankful for the amazing support the quartet receives from ACW and all of Australia. They are available for performances, functions and coaching workshops. You can read more about them on Facebook, or by going to their website. Ka-Bling! Quartet has been singing together since early 2014, ever since a special after chorus rehearsal sing left them all with goose-bumps! Since then Regina (Bari), Joanna (Bass), Luciana (lead) and Clare (tenor) have taken every opportunity to sing together. They love to try new things, change the words, and improve their barbershop and singing skills through lots of laughter and fun. They received a first placing in their first Eisteddfod outing in September 2014 (South Suburban) and then again in June 2015 (Bunbury) in the Open Ensemble division. 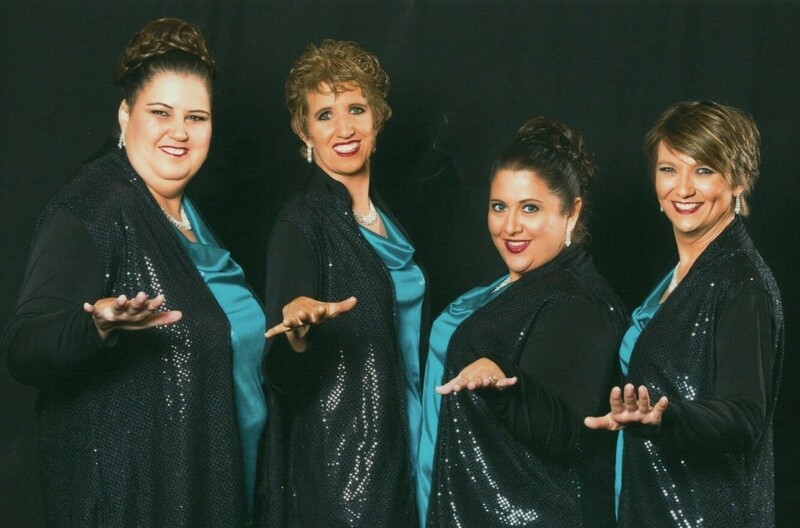 They were very surprised and thrilled to be awarded second place at the Barbershop Harmony Society Western Region contest in May 2015 and were excited and proud to sing in their first Sweet Adelines Regional Convention in Hobart later that month. Ka-Bling! 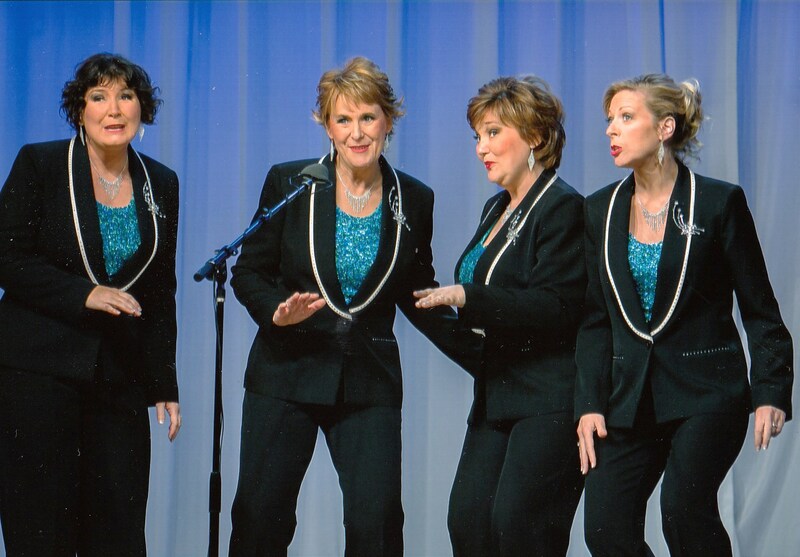 Quartet are very pleased that the convention experience has made them just want to keep doing it! 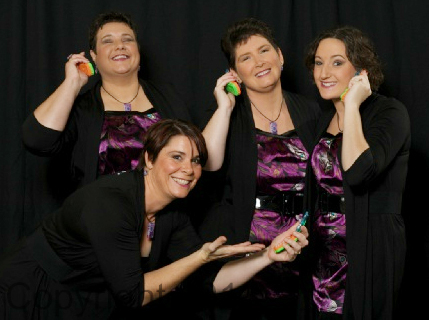 Wavelength originally formed in July 2013 with two members very new to the barbershop artform – Gail (Lead), Maureen (Baritone) – and two very experienced barbershoppers – Caroline (Bass) and Liz (Tenor/Bass). We took the name “Wavelength” to reflect wanting to make wonderful harmonies on everyone’s wavelength and it had a special meaning for our seafaring Bass. We farewelled Liz in Dec 2014 and welcomed Fleur to the reformed Wavelength in May 2015. Fleur was also new to barbershop and even newer at being a Tenor. Wavelength thoroughly enjoyed performing at fundraising concerts held by ACW and were delighted to win the Vocal Ensemble Open Section at the South Suburban Music Society Eisteddfod in October 2015. Unfortunately, with their Baritone moving to the lovely southwest, the tyranny of distance finally took its toll and Wavelength had to call time on their beautiful quartet mid-2016. However, they will all remember the special times performing wonderful harmonies together. Stay Tuned was formed in August of 2011 and consists of Joanna Roper (Tenor), Leonie Bovell (Lead), Sandra Nair (Bass) and Bethan Parnum (Baritone). All are members of A Cappella West chorus based in Murdoch, Perth. Stay Tuned first competed in Canberra in 2012, and thoroughly enjoyed their time together preparing for the stage. Even though there was quite a gap since their last competition, they keenly competed on stage for the 2015 convention in Hobart, and were really pleased to improve their score. Sadly, they have decided to finish on a high and formally announced their retirement shortly after contest. 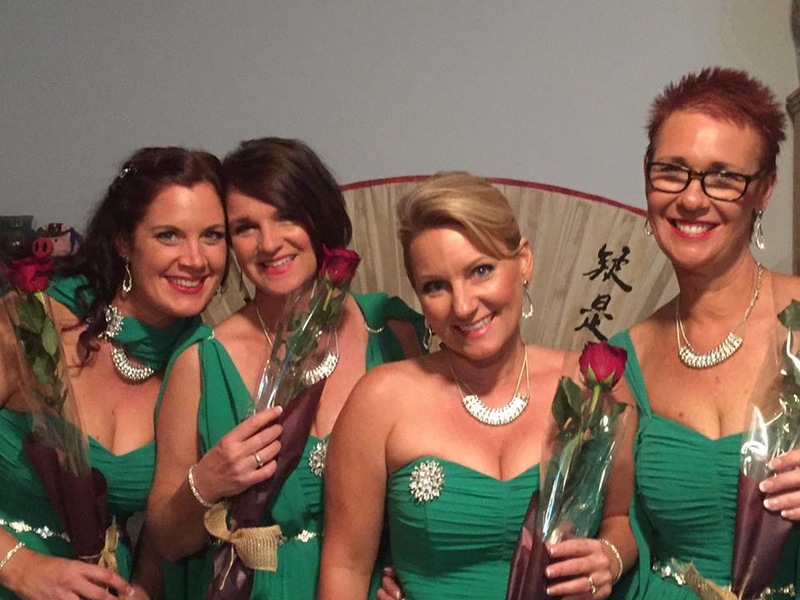 Once upon a time in July 2014, it was suggested that four ladies (Caz tenor, Jenn lead, Ven bass and Lin baritone) might like to try singing a little barbershop together….and Blind Date was born. Blind Date has a philosophy of friendship, singing and improving our barbershop skills and generally having fun doing what we love. Competing for the first time in Hobart helped cement our quartet and we look forward to further adventures together. Blind Date retired in 2015. Nancy, Julie, Ran, and Ro, all novice quartetters, started singing together in mid 2011 and when looking for a name for our quartet thought that Allargando – in a gradually broadening style and slowing tempo – seemed totally appropriate. Keen to improve we got together more often and before we knew it had entered our first region quartet competition in 2012. That was an interesting experience and we learned a lot and even managed to stay friends and keep on singing. Allargando retired in 2013. 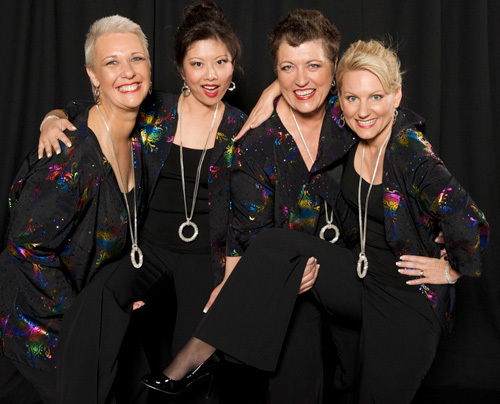 Formed as a long distance quartet in 2009, iCappella was thrilled to come a close second in the national contest in Mandurah 2010 at their second convention. On top of that, as the winners were unavailable, the opportunity to compete on the International stage in Seattle, USA was passed to them – all of Australia was proud to see them perform via the live webcast. 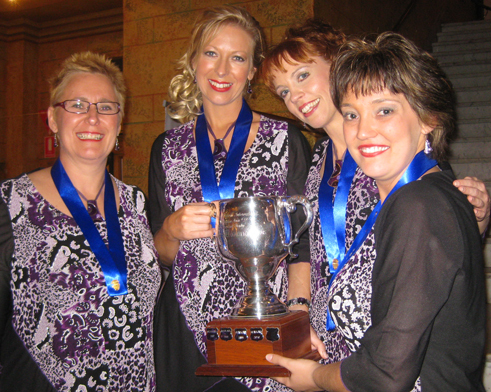 In Newcastle, May 2011, iCappella achieved their goal – to win the coveted gold medal in first place at the Sweet Adelines Regional Convention. Sadly, the quartet chose to disband a few months later. Fling! came together just for fun in 2010 and were made up of a mother/daughter-in-law pair and sisters. They liked to sing all kinds of things, and swap parts whenever it suited! 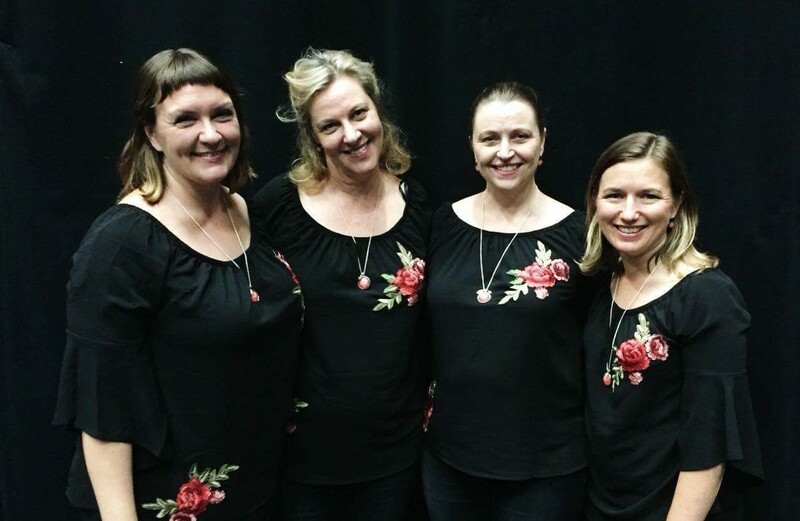 After a successful debut at national contest in Newcastle in 2011 Amie (tenor) moved back to Central Coast, NSW so the quartet became too far flung to continue. In the early part of 2009 our bass, Viviane, said something in French and one of the words was ‘frisson’. When asked what it meant, she said goosebumps – that singing gave her goosebumps. On that day our quartet was named ‘Frisson’. Sloane (tenor), Carolyn (lead), Annette (baritone) and Viviane (bass) had a wonderful time together, forming good friendships as well as learning the artform of barbershop singing, together in a quartet. The journey to regional contest in May 2010 was fun and hard work – but ‘Frisson’s’ debut on the competition stage was an experience they will always treasure and especially one not forgotten by 3 of the quartet who were all novices. Viviane and Carolyn have both moved on, but this will be one wonderful time of their lives the four ladies will never forget! What a journey we have had! Jacqui Sebbage (Bari and “unofficial” Leader of the gang) approached Sandra Nair (Bass) and a few others to start a quartet way back in 2009. We were on our merry way with Kaitlin Sebbage (Tenor) and Leonie Bovell (Lead) and never looked back as our journey was fun, fun, fun and we also learned a lot along the way. Our first big challenge was singing in the National Competition in Mandurah on Friday, 21st May 2010 there was a lot of sweat (no tears, we replaced that with laughter), coaching and rehearsals in April and May and suddenly we were on stage!! It was an unforgettable experience for all 4 of us and we sang the best we had ever sung in public before – so we really could not ask for more than that! We broke all Sweet Adeline records (not official yet) by choosing our competition outfit in less than an hour’s time! 4 of us ‘really’ did think alike and most importantly loved our time together as we laughed and talked and shared our lives – oh yes, we did sing a little bit as well!! No Strings Attached disbanded at the end of 2010 as Jacquie’s health deteriorated from a long term illness. She succumbed to her illness on the 29th December, 2013. We will always hold special memories of Jacquie and our time spent with her. RIP Jacquie.